Despite concern about a domestic Ebola outbreak after the first diagnosis of the virus in the United States this week, senior officials with President Obama's administration on Friday brushed aside a proposed ban on air travel to and from West African countries affected by the virus, arguing the move would be counterproductive. Lisa Monaco, a homeland security adviser to the president, said during a news conference Friday at the White House that such a step could actually "impede" the response to the epidemic that has claimed over 3,400 lives to date. The move would "slow down the ability of the United States and other international partners to actually get expertise and capabilities and equipment into the affected areas," she said, suggesting that the best way to ultimately end the epidemic is to target it at its source in West Africa. "The most effective way to go about controlling this is to prevent those individuals from getting on a plane in the first place," she said. She noted that, since the beginning of the epidemic in March, "Dozens and dozens of people have been stopped from getting on flights in the region." She also said the U.S. has taken a number of steps to help Customs and Border Patrol personnel identify symptomatic individuals and prevent their entry, and she said the government is "constantly going to evaluate" best practices as containment efforts continue. The first diagnosis of Ebola in the U.S. occurred on Monday in Texas. Thomas Eric Duncan, a Liberian national, left the West African nation on a flight bound for the U.S. on September 19. He was admitted on September 26 to Texas Health Presbyterian hospital in Dallas, complaining of flu-like symptoms, but he was released shortly thereafter. Two days later, when he returned to the hospital after his symptoms persisted, he was diagnosed with Ebola and placed in isolation. Since then, officials have identified dozens of people who may have been exposed to the virus, and they've been working to contain any potential spread. To prevent any more people stricken with Ebola from reaching the U.S., some politicians have called for a travel ban to and from the countries that have been hardest-hit by the epidemic. "We should stop accepting flights from countries that are Ebola stricken," said Gov. Bobby Jindal, R-Louisiana, in a statement. 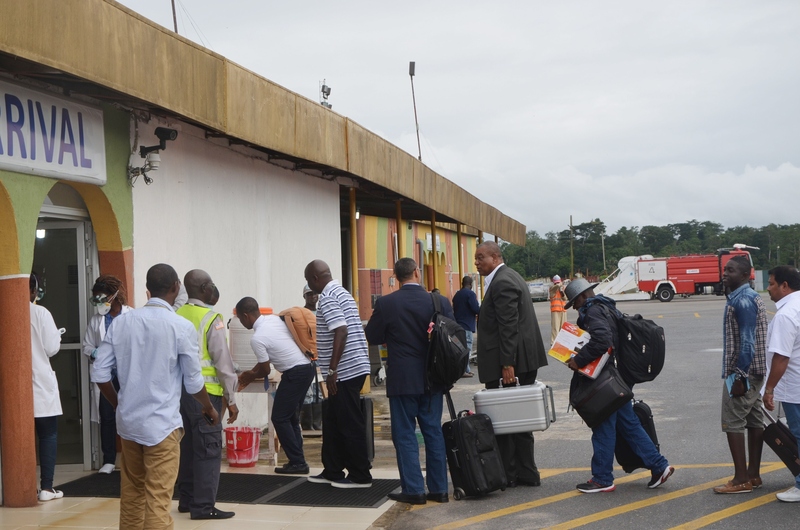 "Even countries in Africa have cut back on or stopped accepting flights from countries with Ebola outbreaks." The administration has said such a travel ban would be counterproductive, Jindal noted, but he added, "That statement defies logic. How exactly would stopping the entry of people potentially carrying the Ebola virus be counterproductive? This seems to be an obvious step to protect public health in the United States." And while he did not call for a travel ban, Sen. Richard Burr, R-North Carolina, slammed the administration for a response that has "been anything but fast and successful." "For the most prepared country in the world we are finding out just how ill-prepared we really are," he said. "It is time to admit the realities that the current strategy to combat Ebola is not working. We need a designated leader, backed by the president, who can meet the urgency of this crisis head on and protect the American people, and end the confusion about who is charge of our total response effort." On Friday, Monaco was joined in the White House briefing room by several other senior officials, who all stressed that, despite any breakdowns in the system that occurred in Texas, the government has the situation well in hand. "There were things that did not go the way they should have in Dallas," acknowledged Dr. Anthony Fauci, the head of the National Institute of Allergy and Infectious Diseases, "but there were a lot of things that went right...the fundamental core basis of preventing an outbreak - contact tracing - is now going on." Fauci said it's "entirely conceivable" there may be more cases in the United States, but he stressed that the United States has a robust health care infrastructure capable of preventing the kind of widespread outbreak that's being seen in Africa. "I take nothing lightly, but I'm convinced by what we have all said today that the system that's in place...would make it extraordinarily unlikely that we would have an outbreak," he said. Monaco stressed that since the outbreak began in March, "tens of thousands" of individuals from affected countries have traveled to the U.S., and only one "isolated case in Texas" has resulted. Health and Human Services Secretary Sylvia Mathews Burwell added, "We recognize the concern that even a single case of Ebola creates on our shores, but we have the public health systems and the public health providers in place to contain the spread of this disease." Their message was meant to be a calming one, reassuring the American public that the prospect of an outbreak at home remains incredibly remote. The officials also provided an update on the U.S. efforts to halt the spread of the disease in West Africa. Mr. Obama has announced plans to send 3,000 U.S. troops to affected countries to assist local forces in containing the disease, though Pentagon spokesman Rear Adm. John Kirby said Friday that number could reach 4,000. The president has also outlined a $750 million plan to fight the virus and strengthen efforts aimed at education, prevention, and treatment. Gen. David Rodriguez, the head of U.S. African Command, said the United States would "do everything in our power to address and mitigate any potential risk to our service members, civilian employees, and their families." White House press secretary Josh Earnest said Friday that the president spoke with Gen. Rodriguez by phone en route to Indiana for a town hall focused on the economy. The general updated him on the military's response to the outbreak on the ground in West Africa. "The United States is prepared to deal with this crisis both at home and in the region," Monaco said at the top of the briefing, neatly summarizing the administration's attempts to reassure. "Every Ebola outbreak over the past 40 years has been stopped. We know how to do this, and we will do it again."